Another day, another story linking Roma star Alisson with a move to Anfield. Multiple outlets in Italy indicate that the Brazilian international could be leaving the Italian club this summer. According to Il Tempo, Liverpool are ‘favorites’ to hire the services of the former Internacional goal keeper, who ‘will’ leave the Giallorossi in the summer transfer window. 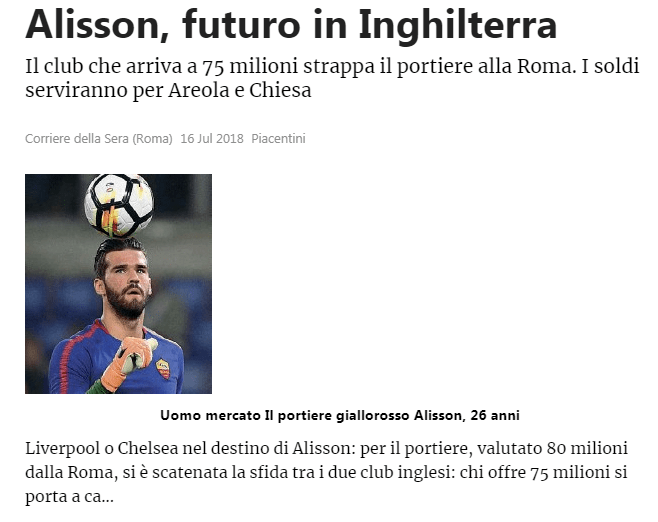 On the other hand, Corriere della Serra claimed that €80million rated Alisson’s future is in England but the club who reaches the value of €75million will be able to secure the signing of the player. 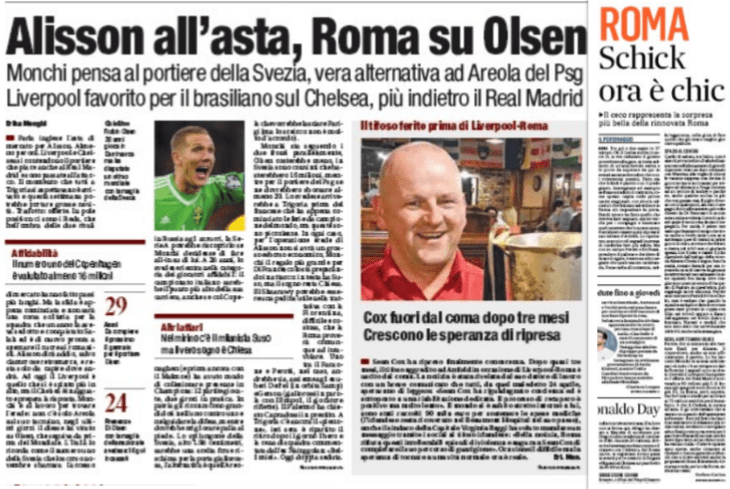 From the cash, Roma will move to sign Areola and Chiesa. The 25-year-old shot stopper made 49 appearances in all competitions for the Italian club, conceded 47 goals and kept 22 clean sheets. It must be noted that Liverpool scored 7 goals past him in the semi finals (two legs) of the Champions League last season. For the national side, he featured in 5 games at the 2018 World Cup, conceded 3 goals and kept 3 clean sheets. Everyone at Anfield is aware of the fact that the club have got two of the most unreliable goal keepers in the Premier League (Karius and Mignolet) and therefore, Klopp has to splash the cash and sign a new No.1. Alisson is highly rated and a wanted man in the market but it will be fair to say that his price tag is really massive. If the Reds do end up paying €75million for the Samba star, then he will become the most expensive goalie in the history of the game. We shall see how the transfer saga unfolds in the coming days.